28 Commercial Real Estate & Properties in Varsity Lakes are listed in 4 categories. We have 19 OfficesLease , 6 Industrial Warehouses Lease , 3 Retail ShopsLease and 1 ShowroomsLease . 120m2 office space available Fit it out in place large boardroom, offices, open plan, reception State of the art air conditioning Car parking available on site Abundant natural light Located in the highly sought after Varsity Lakes Business Park area Call Renee now to inspect Approx Disclaimer: Ray White has not independently checked any of the information we merely pass on. We make no comment on and give no warranty as to the accuracy of the information contained in this document which does not constitute all or any part of any offer or contract by the recipient. Prospective purchasers / lessees must rely on their own enquiries and should satisfy themselves as to the truth or accuracy of all information given by their own inspections, searches, inquiries, advices or as is otherwise necessary. No duty of care is assumed by Orchid Avenue Realty trading as Ray White Surfers Paradise Commercial divisions toward the recipient with regard to the use of this information and all information given is given without responsibility. Professional Offices In Varsity! $1,725 pcm + Outgoings + .. Impressive Professional Offices $2,950 pcm + Outgoings + ..
Coworking | Cafes And Shops Nearby | Excellent Amenities $116pw | 1 Person Workspa..
PROPERTY OVERVIEW $116pw Price incl. Coworking desks for rent in a modern shared office in Varsity Lakes. This contemporary workplace is home to a professional services company and there are now two spare workstations that can be rented together or individually. The high end office is ideally suited to freelancers, entrepreneurs or remote workers who need a comfortable and impressive space that’s ready to use – with inclusive fast internet, 24 7 access, printing facilities and shared meeting rooms, you can move in tomorrow and get straight back to work. Large windows welcome a huge amount of natural light and fantastic water views promote inspiration and wellbeing. 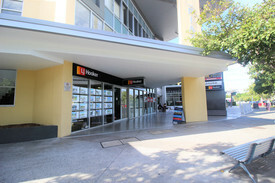 Good on the budget and great for the business, this high end shared office space is a rare offering in the Gold Coast. Bermuda Point is an innovative eco friendly office development located in Varsity Lakes, the geographical centre of the Gold Coast and a popular business hub. The 5 star NABERS energy rated building features a large welcoming lobby entrance, an onsite cafe where you can pick up your morning coffee, an advanced air conditioning system and parking for 300 cars, 40 motorbikes and 80 bikes – and it uses up to 35 per cent less energy than the average office building. This location grants amazing access to some of the region’s best lifestyle attractions including nearby shopping malls and leisure centres. The advertised office space is perfect for a team of 1. If you need more or less space, we have over 30,000 furnished workspaces all over the world suitable for a team of 1 to 200+. Our award winning team offer a free service that will help you find the perfect solution for your needs, so reach out if you need more help. What you get for your weekly rent , 24/7 Access , 24/7 Security , Access to internal breakout areas , Access to kitchen facilities , Access to secure printer and scanner , Building outgoings included , Electricity usage included , Flexible terms , One simple bill for everything related to your workspace , Regular cleaning , Secure high speed Internet Building features , Abundance of natural light , Air conditioning , Car parking in building (Free) , Disabled access and facilities , New fit out , Onsite Cafe / Restaurant , Print, scan and copy facilities , Taxi / Uber stand close to building 200m to Bermuda Street Bus Stop Adjacent to Fitness First and the popular Varsity Lakes Tavern 1.1km to Market Square's supermarkets, cafes and banks 400m to Bond University 18km to Gold Coast Airport WHO IS OFFICE HUB? Office Hub has largest collection of shared office space, sublet office space, creative coworking office space and serviced offices, perfect for 1 200 employees. Let us take you on a tour of all the spaces that fit your needs and budget. Our service is complimentary and we work for you and the landlord to negotiate the most competitive deal in the market. Let us show you how shared and serviced offices can be the perfect solution for your business. www.office hub.com.au www.office hub.co.nz Conditions apply A portion of the square meterage factors in access to shared space. The advertised price includes any incentives offered based on a 12 month agreement. If a shorter period is agreed to please note the price may increase accordingly. This promotional offer for new tenants only and may be withdrawn at any time due to space availability. Convenient Location | Coworking | Cafes And Shops Nearby $232pw | 2 Person Workspa..
PROPERTY OVERVIEW $232pw Price incl. Coworking desks for rent in a modern shared office in Varsity Lakes. This contemporary workplace is home to a professional services company and there are now two spare workstations that can be rented together or individually. The high end office is ideally suited to freelancers, entrepreneurs or remote workers who need a comfortable and impressive space that’s ready to use – with inclusive fast internet, 24 7 access, printing facilities and shared meeting rooms, you can move in tomorrow and get straight back to work. Large windows welcome a huge amount of natural light and fantastic water views promote inspiration and wellbeing. 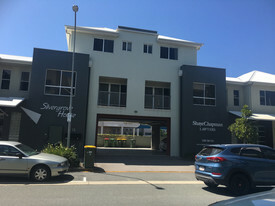 Good on the budget and great for the business, this high end shared office space is a rare offering in the Gold Coast. Bermuda Point is an innovative eco friendly office development located in Varsity Lakes, the geographical centre of the Gold Coast and a popular business hub. The 5 star NABERS energy rated building features a large welcoming lobby entrance, an onsite cafe where you can pick up your morning coffee, an advanced air conditioning system and parking for 300 cars, 40 motorbikes and 80 bikes – and it uses up to 35 per cent less energy than the average office building. This location grants amazing access to some of the region’s best lifestyle attractions including nearby shopping malls and leisure centres. The advertised office space is perfect for a team of 2. If you need more or less space, we have over 30,000 furnished workspaces all over the world suitable for a team of 1 to 200+. Our award winning team offer a free service that will help you find the perfect solution for your needs, so reach out if you need more help. What you get for your weekly rent , 24/7 Access , 24/7 Security , Access to internal breakout areas , Access to kitchen facilities , Access to secure printer and scanner , Building outgoings included , Electricity usage included , Flexible terms , One simple bill for everything related to your workspace , Regular cleaning , Secure high speed Internet Building features , Abundance of natural light , Air conditioning , Car parking in building (Free) , Disabled access and facilities , New fit out , Onsite Cafe / Restaurant , Print, scan and copy facilities , Taxi / Uber stand close to building 200m to Bermuda Street Bus Stop Adjacent to Fitness First and the popular Varsity Lakes Tavern 1.1km to Market Square's supermarkets, cafes and banks 400m to Bond University 18km to Gold Coast Airport WHO IS OFFICE HUB? Office Hub has largest collection of shared office space, sublet office space, creative coworking office space and serviced offices, perfect for 1 200 employees. Let us take you on a tour of all the spaces that fit your needs and budget. Our service is complimentary and we work for you and the landlord to negotiate the most competitive deal in the market. Let us show you how shared and serviced offices can be the perfect solution for your business. www.office hub.com.au www.office hub.co.nz Conditions apply A portion of the square meterage factors in access to shared space. The advertised price includes any incentives offered based on a 12 month agreement. If a shorter period is agreed to please note the price may increase accordingly. This promotional offer for new tenants only and may be withdrawn at any time due to space availability. Highly Sought After Office - Varsity Business District $295/m2 Gross + GST + $10..
77m2 office space available Fit it out in place large boardroom, open plan, reception State of the art air conditioning Car parking available on site Abundant natural light Located in the highly sought after Varsity Lakes Business Park area Call Renee now to inspect. Approx Disclaimer: Ray White has not independently checked any of the information we merely pass on. We make no comment on and give no warranty as to the accuracy of the information contained in this document which does not constitute all or any part of any offer or contract by the recipient. Prospective purchasers / lessees must rely on their own enquiries and should satisfy themselves as to the truth or accuracy of all information given by their own inspections, searches, inquiries, advices or as is otherwise necessary. No duty of care is assumed by Orchid Avenue Realty trading as Ray White Surfers Paradise Commercial divisions toward the recipient with regard to the use of this information and all information given is given without responsibility. 145m2 123m2 First Floor office space available now Quality existing fit out in place in this modern innovative building Fast internet completely data cabled High building security with video surveillance Roof top entertainment area Close access to the highway and Bermuda Road Visitor car parking bays Secure tenant basement parking 24 hour access to building Call Renee to inspect today approx Disclaimer: Ray White has not independently checked any of the information we merely pass on. We make no comment on and give no warranty as to the accuracy of the information contained in this document which does not constitute all or any part of any offer or contract by the recipient. Prospective purchasers / lessees must rely on their own enquiries and should satisfy themselves as to the truth or accuracy of all information given by their own inspections, searches, inquiries, advices or as is otherwise necessary. No duty of care is assumed by Orchid Avenue Realty trading as Ray White Surfers Paradise Commercial divisions toward the recipient with regard to the use of this information and all information given is given without responsibility. 125m2 First floor office now available 145 300m2 Ground floor office available soon High end existing fit out in place Open plan, board room, reception, offices Secure basement podium parking options Available now Approx Disclaimer: Ray White has not independently checked any of the information we merely pass on. We make no comment on and give no warranty as to the accuracy of the information contained in this document which does not constitute all or any part of any offer or contract by the recipient. Prospective purchasers / lessees must rely on their own enquiries and should satisfy themselves as to the truth or accuracy of all information given by their own inspections, searches, inquiries, advices or as is otherwise necessary. No duty of care is assumed by Orchid Avenue Realty trading as Ray White Surfers Paradise Commercial divisions toward the recipient with regard to the use of this information and all information given is given without responsibility. Bike Racks & Showers | Enjoyable Working Environment | Buses Nearby $230pw | 2 Person Workspa..
PROPERTY OVERVIEW $230pw Price incl. This office space is a fun, modern coworking environment with a buzzing community of entrepreneurs and established businesses who come together to enjoy networking events and social activities. Stylish and contemporary, the coworking area has working space for lease ranging from serviced offices, hotdesking and permanent desks with access to casual meeting rooms and large format event spaces. This creative coworking space has awesome on site facilities including a fitness centre and cafe, located in the north Varsity Lakes area of the Gold Coast. The shopping and eateries at popular Market Square Shopping Centre are nearby while the locality benefits from great transport links to other parts of the city. Central Park is close making it easy to step outside and enjoy the sun at lunchtime, while the building itself has lift access, disabled access, car parking, CCTV, showers and bike racks with a pet friendly policy. The advertised office space is perfect for a team of 2. If you need more or less space, we have over 30,000 furnished workspaces all over the world suitable for a team of 1 to 200+. Our award winning team offer a free service that will help you find the perfect solution for your needs, so reach out if you need more help. What you get for your weekly rent , 24/7 Access , Access to internal breakout areas , Commercial grade internet , Electricity usage included , Flexible terms , Premium Coffee/Tea Facilities , Fully equipped boardrooms, meeting rooms and day offices (fees may apply) , Plug and play furnished workspace , One simple bill for everything related to your workspace , FREE business networking events , Collaborative space with a great community feel Building features , Air conditioning , Bike racks , Dedicated men and ladies bathrooms , Disabled facilities , Modern fit out , Natural light , Showers , Modern communal food preparation areas , Car parking in building (Paid) , Car parking Street (Free) , Company Branding at reception , Concierge on ground floor , Pet friendly office space , Creative co working space 210m from bus links Access from University Drive and Varsity Parade Parking available WHO IS OFFICE HUB? Office Hub has largest collection of shared office space, sublet office space, creative coworking office space and serviced offices, perfect for 1 200 employees. Let us take you on a tour of all the spaces that fit your needs and budget. Our service is complimentary and we work for you and the landlord to negotiate the most competitive deal in the market. Let us show you how shared and serviced offices can be the perfect solution for your business. www.office hub.com.au www.office hub.co.nz Conditions apply A portion of the square meterage factors in access to shared space. The advertised price includes any incentives offered based on a 12 month agreement. If a shorter period is agreed to please note the price may increase accordingly. This promotional offer for new tenants only and may be withdrawn at any time due to space availability. Terrific Showroom Available For The First Time In 20 Years!! $5,831.25 pcm + GST + Out.. This style of quality showroom rarely becomes available in this extremely well held area. The tenancy is available on the 10th April and is available as unit 1 at 311m2, unit 2 at 311m2 or combined at 622m2. Includes tea room & ablution facilities. Situated close to the M1, 1.5km from Varsity Lakes Train Station & minutes from Robina Town Centre & Burleigh Heads. This opportunity does not arise often! Contact the Exclusive Agents NOW! This style of quality showroom rarely becomes available in this extremely well held area. The tenancy is available on the 10th April 2018 and is available as unit 1 x 311m2 and unit 2 x 311m2 or combined in one of 622m2. Includes tea room and ablution facilities. Situation close to M1, Burleigh Heads and Robina Town Centre. Varsity Lakes Train Station is within 1.5kms. This opportunity does not arise very often, contact the exclusive agents now! 125m2 of level 1 office space Quality existing fit out in place in this modern and innovative building High building security with video surveillance Roof top entertainment area Close access to the highway and Bermuda Road 10 visitor car parking bays 24 hour access to building Secure basement parking Available now, inspect today approx Disclaimer: Ray White has not independently checked any of the information we merely pass on. We make no comment on and give no warranty as to the accuracy of the information contained in this document which does not constitute all or any part of any offer or contract by the recipient. Prospective purchasers / lessees must rely on their own enquiries and should satisfy themselves as to the truth or accuracy of all information given by their own inspections, searches, inquiries, advices or as is otherwise necessary. No duty of care is assumed by Orchid Avenue Realty trading as Ray White Surfers Paradise Commercial divisions toward the recipient with regard to the use of this information and all information given is given without responsibility. A wonderful opportunity to lease a stunning commercial unit in an excellent location, within 800 metres to the M1 motorway Varsity Lakes Train Station this property has the lot: High quality office fit out over 2 levels Ground floor tiled reception area Fully air conditioned over both levels Numerous meeting rooms or offices Good amenities with kitchen, shower toilets Undercover car parking Flexible usage options, office, showroom with small warehouse area The property has a ground floor area of 250sqm with mezzanine area of approx. 219sqm . Contact James Young on 0417 601 987 to arrange an inspection. Approx Disclaimer: Ray White has not independently checked any of the information we merely pass on. We make no comment on and give no warranty as to the accuracy of the information contained in this document which does not constitute all or any part of any offer or contract by the recipient. Prospective purchasers / lessees must rely on their own enquiries and should satisfy themselves as to the truth or accuracy of all information given by their own inspections, searches, inquiries, advices or as is otherwise necessary. No duty of care is assumed by Orchid Avenue Realty trading as Ray White Surfers Paradise Commercial divisions toward the recipient with regard to the use of this information and all information given is given without responsibility. 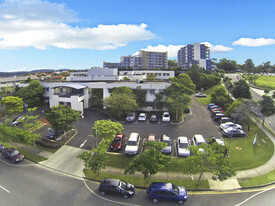 Fully Fibre Connected Office Space At The Best Value In Varsity Lakes From $275/sqm pa + GST GR..
RP1 Building, Varsity Lakes, offers the best value rent on the Gold Coast! Available on a short term / long term leases, there are limited opportunities to lease fitted out office space with full fibre connectivity at well under market rental. Office space available range from 255 square metres Access to Fibre Optic Internet (Fully Cabled) Partly fitted out offices Flexible lease terms On site secure car parking Leasing rates start from $275/sqm pa + GST GROSS Please contact the listing agent, Brad Duncalfe from Ray White Commercial GC South for more information. Modern 195m2 Factory $2,193.75 + GST + Outgoin.. This fairly new modern tilt panel factory is located on Scottsdale Drive, Varsity Lakes. Measuring a very useful 195m2 the property consists of Large open Factory Area Lunch room with sink & cabinet Motorised Roller Door 3 Exclusive use car parks Available September 1st The designed signage opportunity on the illuminated directory signboard frontage Scottsdale Drive, take this opportunity to grow your business from here. Two offices and reception in Varsity Parade with loads of natural light. Electricity, air conditioning and outgoings included. $400 per week plus GST. The smaller office is 3x3 meters. plus 1 x desk included The larger office is 6.5 x 4 meters. Plus 2 x desks included and optional reception area with built in desk All inclusive in the price is: • A/C • Electricity • Lease term negotiable (Flexible) • Boardroom access • Kitchen & meals area including fridge and microwave • Free undercover onsite parking Please Call Claudia on 0429 055 + show full number Please note that the information in this advertisement is to the best of our knowledge and we do not hold responsibility should any information differ. This includes availability dates, these are approximate and may be subject to changes. Please also note that the photos in this advertisement may not be the most recent of this property, and may vary slightly.